Fall is here and the cooler weather is not far behind! As our neighborhood changes colors and temperature, update your Third & Valley apartment to change with the season as well. We are all familiar with a “spring cleaning” but spring shouldn’t be the only time when your apartment gets a deep and thorough cleaning. Before you get your apartment ready for the fall, make sure to declutter and clean your apartment so you can give it a fresh new look. During the spring and summer, people tend to decorate with bright colors like turquoise, yellow and coral and use lightweight fabrics like linen and cotton. You can tuck those away for the next 6 months and update your apartments décor by replacing them with darker, fall-appropriate earth tones. If you have a neutral-colored couch, add throw pillows in colors like burnt orange, deep red and olive green. Switch your gauzy window treatments with heavier ones that will still let light in while keeping warmth inside your home. For your kitchen table, you can put out a bowl of apples (real or fake) and earth tone placemats. Check out our local Target for some inexpensive, fun fall finds. Scents are useful when decorating your apartment especially in the fall. 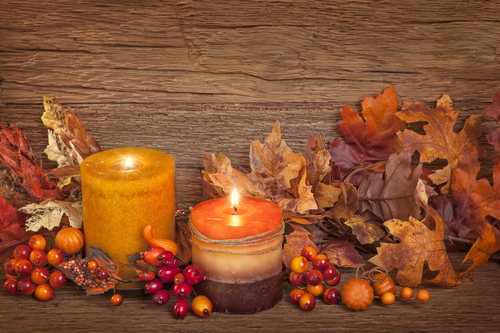 There are many autumn scents that will have your apartment smelling crisp and cozy in no time. We suggest putting pumpkin spice, cinnamon or a crackling candle with a woodsy aroma in the middle of your living or bedroom. Of course, if you enjoy cooking having the aromas of pumpkin bread, apple pie or anything with cinnamon will also do the trick and make your friends and family happy when they come over to visit! If you don’t want to spend a lot of money on purchasing fall décor, you make your own fall-themed decorations for the apartment. Take a walk around South Mountain Reservation or a local park and see what you can find! A bundle of fallen twigs wrapped up with a pretty bow would look great in an entry way or next to a fireplace, while a ceramic bowl can be filled with pumpkins and seasonal gourds to place on a coffee table.